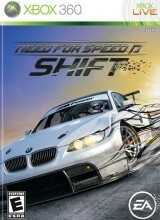 Unfortunately, “Need For Speed Shift” is proof that only a small handful of games are meant to be true racing sims. Originally, the “Need For Speed” series was a decent attempt at simulation racing; a decent-selling one, at that. However, the series changed completely in favor of underground street racing. When that happened, the series boomed in popularity extremely fast, raking in the big bucks as every new iteration flooded the store shelves all over the place. Since then, the series has undergone a few changes here and there in an attempt to take back the simulation side of the genre, but it just hasn’t seemed to work out. This latest attempt is just a testament to that very fact; it’s better left as an addictive and simple street racing series. That said, it’s time to hit the tracks in the latest installment of EA’s popular series, “Need For Speed Shift” for the Xbox 360. Giving up the typical high framerate, it seems as though the design team went for a somewhat different look this time around. The game seems to be locked to around 30 frames per second, but the visuals have been cleaned up a lot by comparison to the other games in the series. Grass, asphalt bright skies; all sorts of stuff pops out in this game. However, despite the fact that the circuits and backgrounds are fairly attractive, every vehicle in the game is only average at best. The vehicles in this game don’t even compare to most other high caliber racers out there these days. Still, there’s not any real problems with the visual quality. It just falls into the “not too shabby” category. The vehicles sound okay, but that’s nothing to write home about. As for the soundtrack, it’s certainly passable, but it doesn’t even come close to the powerful tracks found in past “Need For Speed” titles. There’s not much else to talk about in the sound category, though, aside from a single voice actor that explains everything as you move along through the game’s many courses. His voice fits well enough and he does a good job, but other than that, there just isn’t much to speak of. This one’s all about the gameplay. Speaking of gameplay, it’s about that time. As much as I enjoy most of the “Need For Speed” games, this one just didn’t do it for me. For starters, I can’t decide if it’s the entire set of vehicles that are unresponsive or if it’s the control scheme in general. The controls seem very loose, which is odd for a racing simulation video game. It seems like there may be a forced 1 second or so delay every time the analog stick is tilted into a turn, but that makes no sense. Why would anyone add a delay to the controls of a racing game? I just don’t get it, but it’s surely very noticeable regardless of which console or controller you’re using. I just hope the loose controls are a bug that’s getting patched in an upcoming version update, at the very least. At any rate, there are not a ton of cars in this game and every race generally feels the same, which gives the game a very bland and repetitious feeling. On the same note, vehicles are not very fun to customize because the game is simply broken. There’s no other way to put it. Customizing cars seems to make the game harder, no matter how logical your “advanced” tuning may actually be. Even the visual customization doesn’t get very deep, especially considering that even the default vinyls are almost all extremely ugly. Once you’ve managed to stink it up and deal with it, the racing isn’t too bad, so long as you keep the settings relatively balanced. If the settings get too simplified, the game will auto brake and all sorts of other stuff, which completely takes away the fun and challenge of racing. I discovered that it’s literally possible to play the entire game on the easiest settings by holding the gas button down and simply turning when needed. As far as the more difficult settings go, there’s nothing realistic about it. I don’t even think much testing or research went into the physics of this game, considering how little actually changes. The most basic things change, all of which primarily impact how hard you should be hitting the gas or breaks at any given time, but it’s not nearly as deep or realistic as it should be. If you can deal with all of those problems, there’s actually a decent game under the hood, despite the lack of variation. With only a handful of tracks and a giant amount of unlocks given in a very short amount of time, just about everything can be unlocked before the second tier is even finished. That’s a double-edged sword, considering the fact that the goal of the game can be completed in a very short amount of time, but most players should enjoy the selection of events. The actual criteria for unlocking stuff is a simple matter of earning points and stars. During races, you can earn points by performing various tasks such as perfect cornering or drafting. Those points are added up to ultimately increase your driver level, which grants random rewards such as new vinyls and free money. Stars, on the other hand, unlock new events. Earnings stars in most cases is as simple as coming in first place and racking up a very small amount of points, but sometimes there are special objectives. None of the special objectives really change the game much and truthfully, they almost go completely unnoticed. As for the events themselves, they’re standard fare these days. Standard races with 8 drivers, head to head races with only 2 drivers and even drifting are all here, but none of the event types stand out. At the end of the day, “Need For Speed Shift” is a generic racing sim that simply can’t even compete with the big names in the industry. Overall, I genuinely feel that EA should stick to the streets for the “Need For Speed” series. This circuit simulation stuff just isn’t working out. -Can be played by a 3 year-old on easiest settings. -Everything can be unlocked fairly early. -Car customization hurts more than it helps. -Physics are far from realistic. -Events feel re-used far too often. If you absolutely need to own every “Need For Speed” game, I guess no review is going to stop you from buying this game. Otherwise, sit this one out and wait for “Forza Motorsport 3” later this month for a real racing experience.